Unclaimed property compliance is complex. As a result, organizations large and small put themselves at risk, often because they misunderstand the intricacies and scope of the legislation and regulations involved. The price of non-compliance can be high and includes facing lengthy audits, damages to company reputation, costly penalties, and interest payments. At Keane, our consultants have a proven strategy for conducting a strategic unclaimed property risk assessment and analysis that examines corporate history and financial records to quantify potential audit exposures. Our team will summarize your liability and develop a roadmap for how to comply and protect your organization. We specialize in analyzing current systems, accounting procedures, and reporting practices to identify any potential gaps or omissions.  We also provide customized solutions and enhancements to help you properly classify, report, and document unclaimed property compliance procedures. With the current economic environment and growth of state budget deficits making this challenging landscape even more complex, it’s important to work with a team that possesses extensive abandoned property compliance knowledge. The Keane team knows which issues are hot buttons for the states, such as Sarbanes-Oxley (SOX) compliance, SEC Rule 17Ad-17 compliance, and the increase in audits of life insurers. Our team of consultants is well versed in each of these and can help your organization mitigate your audit risk and liability. The Sarbanes-Oxley Act (SOX) of 2002 created much needed structure around financial reporting and internal controls. As if by design, the reforms prescribed by SOX coincide with states’ historic efforts to enforce and ensure unclaimed property compliance. As such, SOX compliance should directly improve unclaimed property management practices, in the process reducing financial and reputational risk. While SOX applies only to public companies, it provides excellent guidance that can benefit private entities as well. Since it was adopted in 1997, SEC Rule 17Ad-17 has governed the manner in which corporate transfer agents, mutual funds, and other paying agents have handled lost shareholders in the early stages of the unclaimed property compliance process. With the passage of the Dodd-Frank Financial Reform Bill in 2010, requirements are now being extended to the broker/dealer community – which had previously been exempt – introducing a new and potentially burdensome array of operational reporting requirements and costs. From locating owners and dealing with uncashed checks to understanding compliance exceptions, Dodd-Frank promises to make an impact on the broker/dealer community.